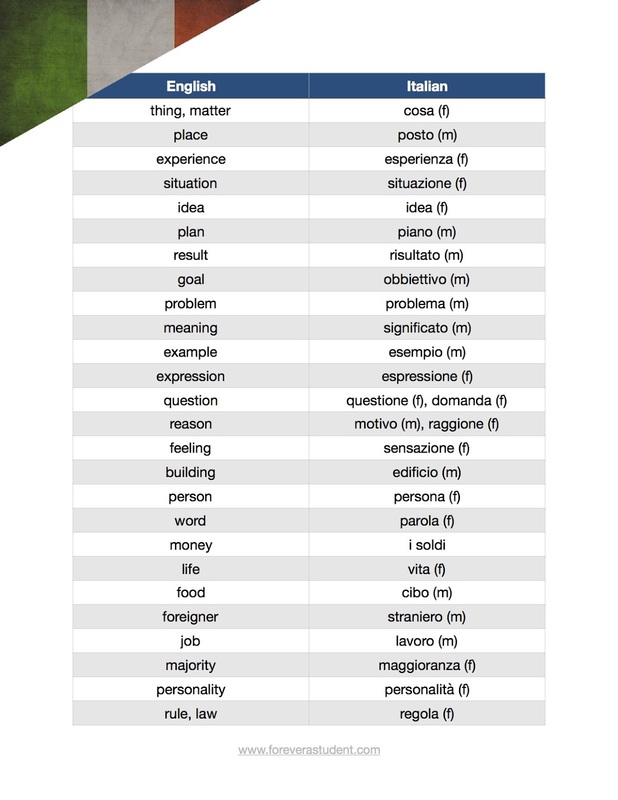 The following is the list of the top 150 most frequent, most common and most useful nouns to learn when learning a foreign language and its Italian translation. It is based on about 5 different vocabulary frequency lists and my personal word lists which contain words that were occurring organically when I was learning languages from scratch or improving the languages I knew (Persian, Serbian, Polish, Cantonese, Spanish, Hungarian, French). This list contains only the most important nouns from all of these lists, that give you most language coverage, re-arranged so that they would roughly be ordered from the most useful, most general ones downwards. I also worked on English, Spanish, Italian, French, Romanian, Portuguese, German, Mandarin Chinese (simplified and traditional), Russian (Cyrillic and Latin), Slovak, Hungarian and a Romance combo noun frequency list. I know how to learn languages well from the intermediate level and onward, but I have a very big problem starting, which I think might be a problem for most people as well. In my opinion, the main reason for this difficulty is the complete lack of vocabulary when you are starting out on your language learning journey—you don’t have the most basic building blocks to say or understand anything. I had the idea to pre-learn a lot of words to bypass this problem, but the question was always which words to learn. When I was learning Turkish (a distant language from the languages I speak with a relatively low number of cognates), I realized the easiest words to learn were concrete, tangible nouns (house, apple etc.) because I could visualize them very well in my mind. There are much more useful words/expressions of course (because, to have, to be, even though, if, I, you etc.) but they hold a lot more information and are more difficult to remember and relate to for a complete beginner. Although I am a big proponent of learning things with context, the painstakingly long time it takes to get to a point where you are able to start having conversations and learn the language "by using" is really something that should be improved. The idea thus is to pre-learn smart-vocabulary with no context with memory techniques, to give you more speech building blocks at your disposal whether to help you start speaking or understanding. I first had the idea of producing a list of high-frequency, useful tangible nouns which I would pre-learn with memory techniques but when I started compiling the list, it turned out to be surprisingly short (it consisted of only about 25 nouns!) so I decided to compile a list of all nouns I would consider useful. The task turned out to be quite challenging, because it wasn't a simple matter of taking the 5 or 6 most respected frequency lists and merging them together. I had to literally handpick every noun based on my experience and common sense using my own frequency studies and word lists as a basis and frequency lists only as an additional guideline. I will also work on a similar verb list, expressions list and a list of all other high frequency useful words. My plan is also to eventually create a monologue or a very contextual short story made of these words that a student could listen to over and over, or learn by heart if need be, which would serve as a nice way to pre-mass-learn vocabulary to get a student started and enable him or her to start speaking the language as soon as possible. Thank you for sharing this list! I found it really interesting. One thing I realised this year is that the vocabulary you learn at the beggining may affect one's whole learning process. Hello Alessandro. I think the whole point of listening is to be able to understand what and how native speakers are saying so that you can learn directly from them. I think you can learn much quicker this way.